Every day across the nation, children all across America step onto yellow buses to be transported to and from school or school-related events. Travel by school bus is the safest method of transporting children to and from school - only 1% of all student fatalities that occur during normal school travel hours involve a school bus. The safety of school bus travel is achieved through a combination of federal and state laws governing the safe manufacture and operation of school buses. The National Highway Traffic Safety Administration (NHTSA), a federal agency that is part of the U.S. Department of Transportation, was created to carry out safety programs under the National Traffic and Motor Vehicle Safety and Highway Safety Acts. The NHTSA accomplishes its task by creating and enforcing safety performance standards for all types of motor vehicles, including school buses. The NHTSA does not oversee the use or operation of motor vehicles; those laws are left up to the states. The NHTSA regulates the manufacture and sale of new school buses. Under NHTSA regulations, a school bus is a bus that is sold or introduced into interstate commerce for purposes that include carrying students to and from school or related events." For purposes of the NHTSA definition, a bus can be any motor vehicle that can carry 11 or more passengers (including the driver). Emergency exits and windows: Minimum requirements related to windows reduce the likelihood that passengers will be ejected from the bus in the event of a crash. Emergency exists facilitate exit in case of emergency. Seating: Requirements regarding seating and restraining barriers were recently revised to require an increase in seat back height from 20" to 24". Seat belts: The recently revised rule requires all school buses weighing less than 10,000 pounds to have three-point seat belts, meaning those covering the lap and shoulder, installed. Federal standards do not require that school buses greater than 10,000 pounds - which is 80% of all school buses in operation across the country - have seat belts installed. Joint integrity: Requirements regarding the strength of body panel joints seeks to improve the structural integrity of the bus to prevent collapse in the event of a crash. The use and operation of school buses is regulated by the state government, which sometimes delegates that authority to individual school districts. State law regarding school buses can be stricter than federal regulations. For example, some states have laws requiring seat belts be installed on all school buses, regardless of weight, which is different from the Federal Government's seat belt requirement. Only six states have laws in place requiring the use of seat belts on school buses. In 2009, eight other state legislatures proposed bills that would require the installation of seat belts on school buses; the legislation failed in all eight states. In all six states that have enacted seat belt laws, they impose no liability on the school bus driver, chaperones, teachers, the school, school district or any other person for injury caused to any child due to failure to wear the seat belt. Below are some examples of state-specific school bus seat belt laws. All school buses manufactured after July 1, 2005 and designed to carry 16 or more passengers, and all other school buses manufactured after July 1, 2004, must have three-point seat belts installed. Passengers must wear the seat belts, and must be taught to properly use the restraints. All school buses purchased new after December 31, 2000, must have seat belts or another federally approved restraint system installed. All passengers are required to wear the seat belts. All school buses must be equipped with seat belts; however, the requirement is contingent upon school districts receiving funding. School buses are required to have lap belts or another federally approve restraint, and passengers are required to wear the seat belts. New York became the first state to require seat belts on school buses. The law requires that all school buses manufactured after July 1, 1987 have lap belts installed. However, each individual school board can decide whether the seat belts must be used. The only students required under the law to wear the lap belts are special education students. According to the most recent report, only 35 of the 690 school districts throughout the state require students to use the seat belts. Every bus purchased by a school district must have a three-point seat belt installed, and school districts must require that the seat belts be worn. Districts can also implement a disciplinary policy against students who fail to wear the seat belts. Like Louisiana, this law is contingent on the school districts receiving funding to fulfill the requirement. 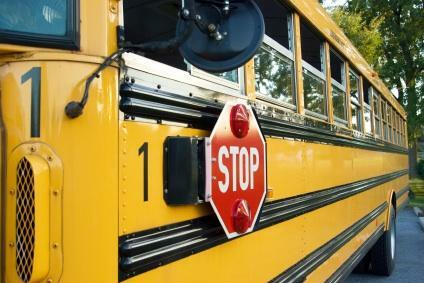 In most jurisdictions, drivers must stop for a school bus when its red lights are flashing and stop sign extended. In some states, you must stop 20 feet from the bus, if possible. Vehicles may not proceed until the red lights stop flashing and the retractable stop sign has been pulled up. The only exception is when the vehicle is separated from the bus by a physical barrier, or if the road has two or more lanes per side. Failure to stop for a school bus can result in traffic citations, fines and points on your licenses. In an effort to crack down on drivers who illegally pass stopped school buses, states are implementing laws to allow cameras on buses that would capture motorists who pass a stopped school bus. Arkansas, North Carolina and West Virginia have already installed cameras. In 2011 and 2012, the Connecticut, Georgia, Maryland, Rhode Island, Virginia and Washington legislatures enacted similar laws. State law varies greatly regarding stopping for a school bus. It is therefore important to review the laws in your state. Your local DMV is an excellent resource to determine the laws in your state. Every weekday morning millions of parents place their most precious asset - their children - on to a school bus, entrusting their safety to not only the school bus driver, but to the federal and state agencies that govern the safe manufacture and operation of school buses. Even without the use of seat belts, school buses are the safest method of transporting children safely to school, resulting in fewer injuries and death than driving in a car, walking or biking to school. Parents can send their children off to school each morning knowing they are in safe hands.